Waldemeyer’s first independent exhibition consists of three pieces each made of Dupont Corian, a versatile, translucent material that allows touch sensitive areas and a large display area ideal for the thousands of embedded LED lights. 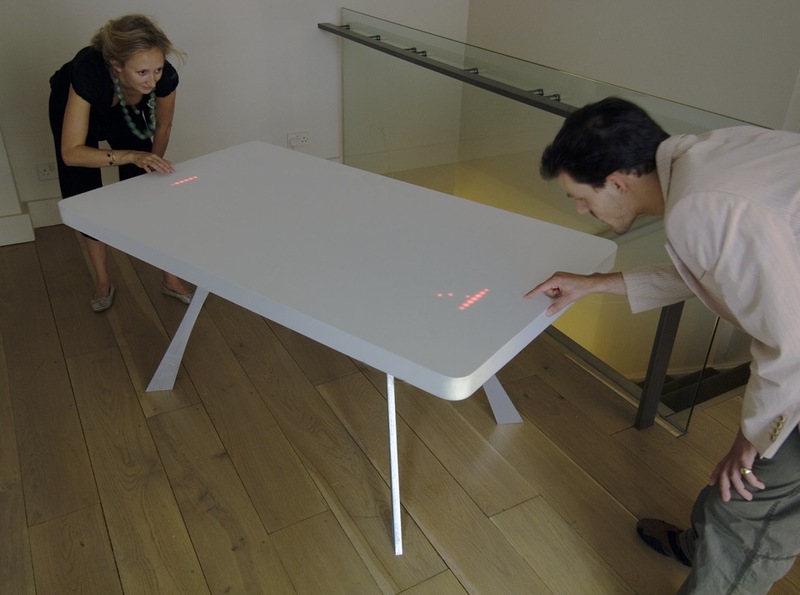 A modern take on a traditional Ping Pong table, the Pong table reinvents the classic pong game, using 2500 LEDs and two track pads. 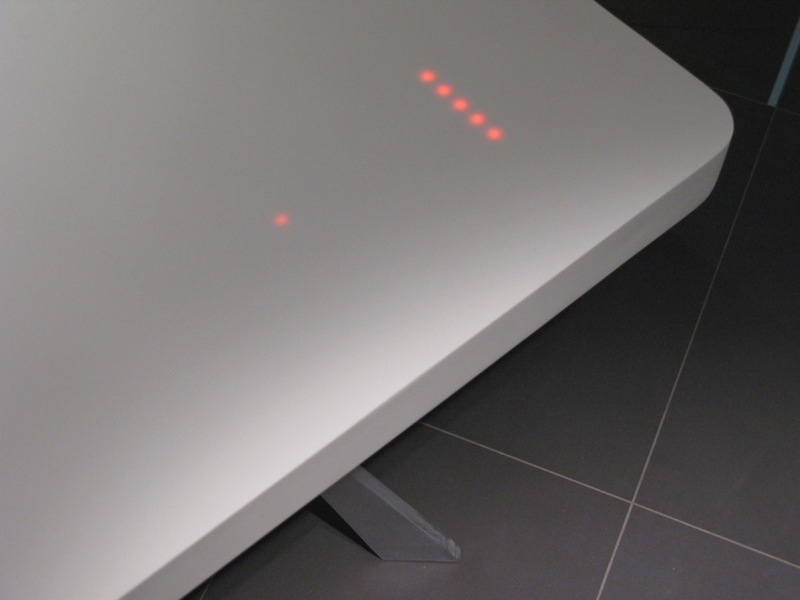 The game is programmed into an inbuilt microchip that controls a matrix of LEDs beneath the Corian surface so that the ball may bounce all over it. 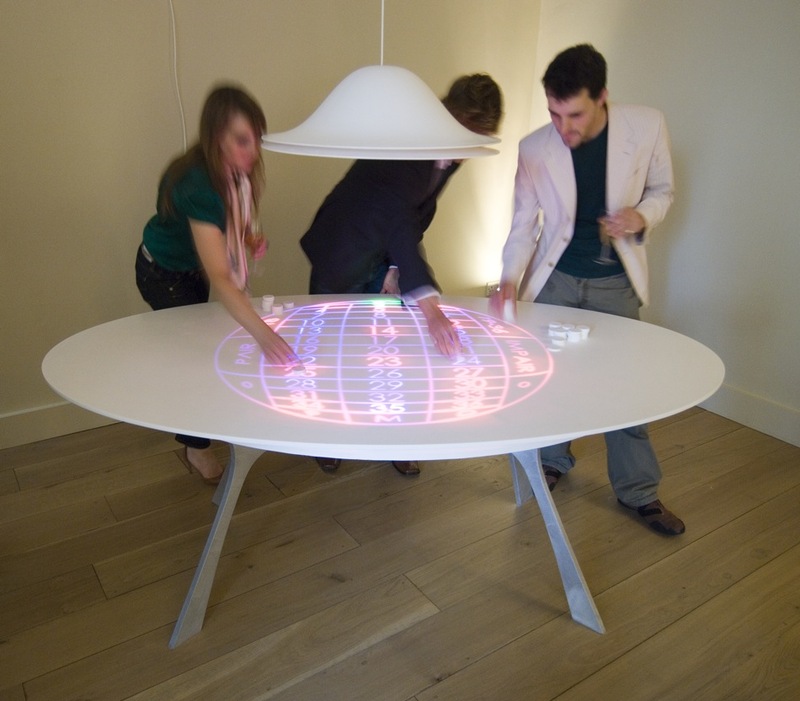 The flashing LED roulette table is something dreamt up from a futuristic Casino Royale. Also using integrated LEDs, the roulette table doesn’t actually use a wheel: When switched on, the LEDs make up a classic roulette table, once the croupier activates the games the roulette grid disappears as randomly generated numbers flash. 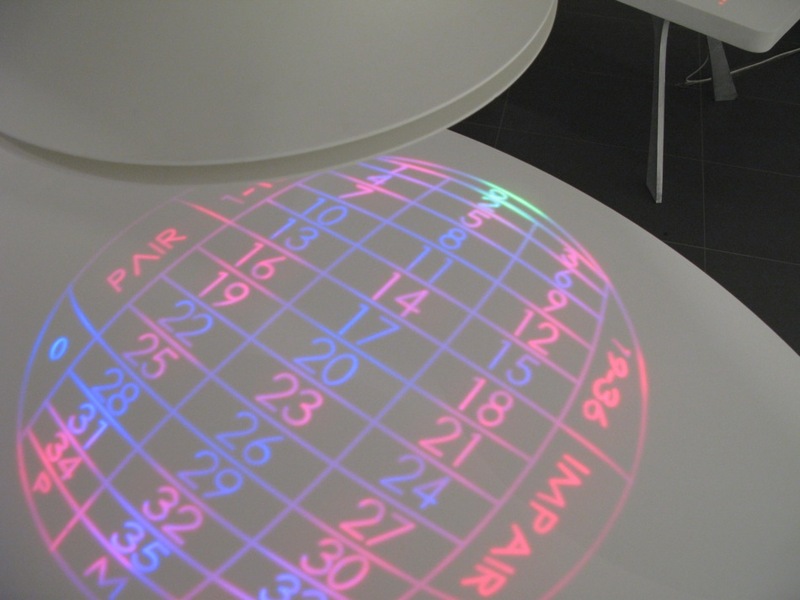 The table uses the input of the croupier as a source for the random number generator. The lamp suspended above the table acts as a symbolic wheel. When the game is activated, LEDs flash as if they are spinning, adding to the casino ambience. When turned off, the integrated technology in both tables disappears completely, leaving a simple, elegant and functional dining table. The abstract mirror exploits the translucent qualities of Corian, diffusing the light brilliantly. 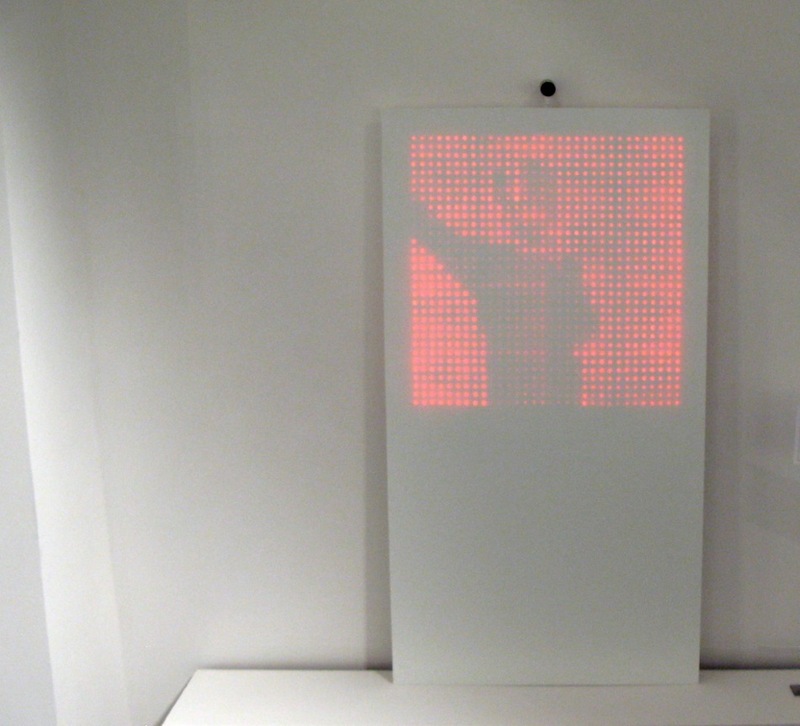 The 1000 inbuilt LEDs display a pixilated reflection of the onlooker generated from an integrated camera lens. Like the modernist mirrors of Man Ray and Duchamp using the reflections of their onlookers as a constantly shifting art-form, Waldemeyer has created his own ready-made portraits of generations to come. The Corian mirror – a technology show case with an embedded LED display within a 12mm Corian sheet without disturbing the front or back surface. This entry was posted on Thursday, September 28th, 2006 at 11:44 am. It is filed under ALL PROJECTS, LIGHT DESIGN, PRODUCT DESIGN. You can follow any responses to this entry through the RSS 2.0 feed.